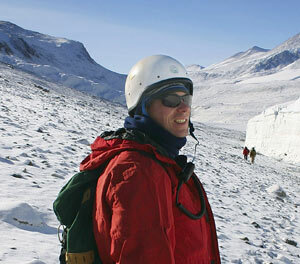 Brent Christner and colleagues collected snow samples from Antarctica to look for bacteria. Bacteria help make delicious yogurts and cheeses and sometimes they make us sick. But do they make it rain? A new study suggests they do: Researchers found that bacteria that enable the formation of tiny ice crystals needed for snow and rainfall are distributed throughout the atmosphere. The findings add a new dimension to atmospheric processes because they show that bacteria may affect precipitation cycles and climate. Tiny ice crystals are responsible for almost all precipitation in the world, says Russell Schnell, an atmospheric scientist at NOAA in Boulder, Colo., who was not involved in the new study. “Even on the hottest summer day, a raindrop was initially an ice crystal,” Schnell says. If they didn’t take this icy form, small water particles such as those that form clouds wouldn’t actually become rain or snow. But to form crystals, water droplets first need nucleators, tiny particles that the droplets can latch onto and grow around. Without them, the water particles can cool down far below 0 degrees Celsius and just stay there without freezing, he says. Previous research has found bacteria that can act as nucleators, helping to form these ice crystals in the atmosphere. But Brent Christner of Louisiana State University in Baton Rouge and his colleagues wanted to establish a direct connection between bacteria and the results of that nucleation: the precipitation. Examining snow from the western United States, Europe, Canada and Antarctica, the team found that bacteria were the initiators of ice crystals from which those snowflakes had grown, they reported Feb. 29 in Science. Scientists have long known that certain bacteria that usually live on plant leaves make excellent ice nucleators. A specific protein sitting on the cell surface is responsible for the effect, says Steven Lindow, a plant pathologist at the University of California at Berkeley, who was not involved in the study. “This protein has features that allow it to bind water molecules and hold them in a structure that looks very much like an ice crystal,” he says. Mineral particles, such as soot and dust, have a similar ability but proteins are much more efficient at catalyzing ice formation, Lindow says. “Minerals can only orient a few molecules but bacterial proteins are big and can orient a lot.” Ski resorts exploit this property by using sterilized bacteria for cloud seeding. And some farmers protect strawberry and potato plants from frost by covering them with a genetically engineered version of the bacterium that can’t produce the protein any more. Although researchers have previously found ice-nucleating bacteria in the atmosphere, the new study “shows cleanly that they can be associated with frozen snow on the ground and strongly implies that these bacteria were the ice nucleant that was required for the formation of the snowflakes in the first place,” Lindow says. That hints that the atmosphere serves as a facet of these bacteria’s lifecycle, Christner says. “These organisms may use the ability to initiate rain as a way to get around.” Wind and thermal currents blow these bacteria up in the atmosphere. They can also be aerosolized during harvest, when tractors produce huge clouds of dust. “It’s no problem for these guys to get airborne,” he says. Once in the air, they can travel to other places and then trigger rainfall to land on other plants. “This is a possible microbial dissemination strategy that hadn’t previously been recognized,” he says. And the fact that the team found bacteria in Antarctica — thousands of kilometers away from vegetation — means that these organisms can travel very long distances and may affect global precipitation patterns. “If they can be transported to Antarctica, they are probably transported everywhere,” Schnell says. The next step is to find out how practices like deforestation, land usage and agriculture impact precipitation cycles, because these practices could alter climate in ways that we haven’t realized, Christner says. “We know that the distribution of plants has an effect on climate just through transpiration, but the ability of inhabitants of those plants to potentially induce precipitation is something that has so far not been considered,” he says.